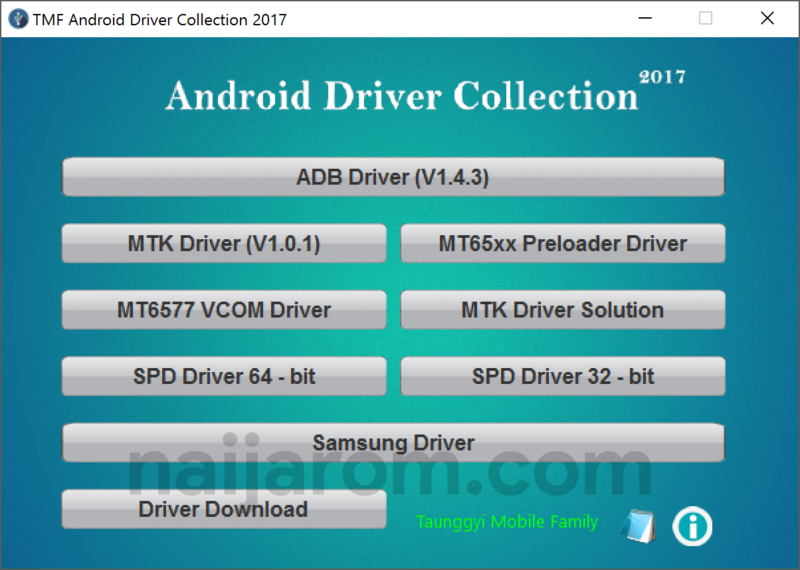 TMF Android Driver Collection 2017 is a small application for Windows Computer which contains ADB Driver, MTK Driver, MT65XX Preloader Driver, MT6577 VCOM Driver, MTK Driver Solution, Spreadtrum Driver 64 and 63 bit, Samsung Driver. The overall interface of the Driver Collection tool is very simple and all you have to click on the required driver button to begin the installation process. The ADB driver works as a universal Android Driver, which works of Establishing connection between the Windows computer and the Android device. The ADB Driver will not work if you are trying to Flash the Stock Firmware or Flashing the IMEI on your Android device. In that situation, you will need to have the individual driver compatible with your Android device chipset type. [*] Credits: TMF Android Driver Collection 2017 is created and distributed by Taunggyi Mobile Family. So, full credits goes to Taunggyi Mobile Family for sharing the tool for free.